Amazon, started a version of a personalized store called My Mix, in June 2017 to help visitors save time and find products quickly. The one common trend across every online store globally is that over 60% of their visitors, engage with the store via a mobile device. This changes the expectation of behavior as visitors on mobile devices have more urgency that visitors on desktop, they are typically on the go and get to see only 2 to 4 products per screen. So should you design a separate site for mobile visitors? No. Applying a personalization engine will address this challenge and a personalized store ensures visitors are more likely to stay longer at your store. What is a personalized store? Personalized stores from Tagalys, collects every signal left by visitors across your site to learn more about their interest and predict what products they might be interested in. This API collects data from online retailers via a Tagalys analytics file, requiring no additional work from clients to snd the data and applies real time 1:1 personalization to create a personalized store in real time. While the benefits are applicable across devices, we feel the personalized store is more suited for mobile users, cause it allows them to engage with online store in a frictionless manner. 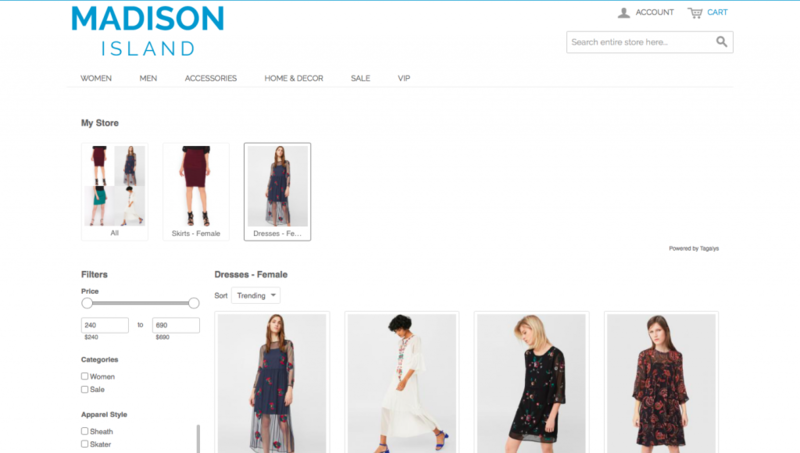 By this we mean, if you have shown interest in midi skirts and maxi dresses for example, instead of having to navigate back to the categories and restart your browsing experience, the personalized store would already have that available for you, saving you clicks, time and the efforts to start your experience. It is like the store reorganizing its aisles for each visitor vs. having each visitor walk across the static store each time to restart their shopping journey. Since the retailer now has the ability to dynamically reprioritize what products & categories to show each visitor based on their unique interest we have seen the following KPI’s improve at the store. How do you signup for Personalized Stores from Tagalys? Signup as a new client at Tagalys and install any of our extensions to your platform. Contact the Tech Support team from Tagalys and request them to enable Personalization for your store, as this API is not enabled by default. Our team will study your product catalog & configuration and work with you the determine the best personalized setup for your store. This process should not take more than 24-48 hours to be completed. Tagalys reports will also showcase the live data on the impact personalization brings to your store. 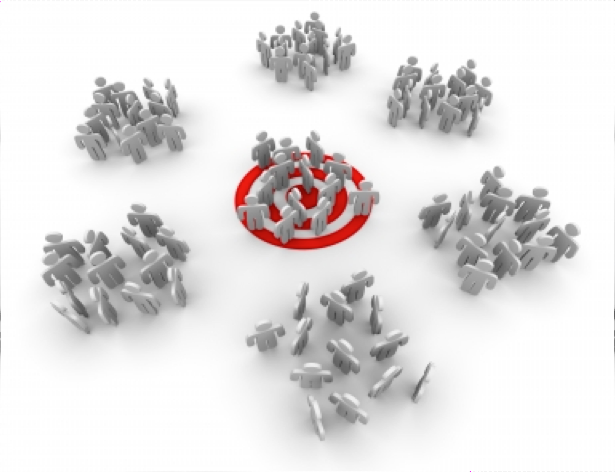 This can help you determine if personalization from Tagalys is right for your business. Do you want the fastest Search (Algolia) or really fast Search (Tagalys) that increases your conversion & revenue? At Tagalys, we obsess about improving product discovery at our retailers. How do we ensure visitors click on more products from search results or how do we ensure they find the most relevant products in the first 3 scrolls. To our customers (online retailers) Site Search under 100ms to ensure scores are calculated and products sorted by what is most likley to sell, to help with end conversion is an acceptable trade off. Read our testimonials to know more. With inbuilt analytics, Tagalys by default sorts search results based on what is trending. Trending is the analysis of visitor engagement data across the entire site to predict the best selling products for any search query, based on historical engagement data. It collects data utilizing Tagays analytics for site wide engagement, understands engagement pattern and determines trending scores for all products. It continues to learn and improve these scores as visitors interacts with the site. We also analyze data patterns across segments or for each visitor, to personalize search. Algolia on the other hand has gone on record and said “Elasticsearch is a wonderful tool for Big Data analytics, but it is very difficult to reach a good relevance with it on database search. You can try to add some logic on top of Elasticsearch or try to reorder manually results for some queries, but it’s tedious work that continuously needs to be tuned. Algolia on the other hand focuses on getting a very good relevance with minimal configuration. While not optimal for all use cases, it makes it particularly appropriate for database search”. The tedious work is what Tagalys has solved for online retailers giving them an out of the box solution, with simple installation. Both Tagalys & Algolia also cover some of the basics of ecommerce search like showing suggestions with autocomplete, spell check & live product synching. Our core lies in the post click analysis to keep learning from patterns and update trending, personalization or localization scores, so the products displayed in search results are more likely to convert. So if we can help you with improving your conversion at less than 100ms, happy to show you a demo anytime. Check out Tagalys search and signup for a free 28 day trial. If you do not have billions of dollars to build your own personalized recommendation engine like Amazon, this post is for you. When you think of Personalization in e-commerce, you should think of Amazon. No online retailer has experimented across varies application of personalization with the goal to help visitors find a product of interest. When you engage with products at Amazon, you start sending signals of intent helping them understand what you might be interested to buy. If you return to the home page, almost instantly you will discover many personalized product recommendations by category to ensure you do not get lost in the store and remain to engage with the products or categories of your interest. Once you have created a persona for each visitor, it is easy to curate the catalog based on their intent and show them exactly what they want. For example, if I am in the mood for running shoes, then when I ask/search for shoes, the retailer would show me running shoes first besides showing the generic product sorting that is defined sitewide. Amazon has been experimenting with this feature with a small subset of products in what is called “my mix”. At Tagalys we call this feature my-store. Essentially, what this allows a retailer to do it dynamically prioritize categories and products for each visitor based on exactly what they want. More on My Store from Tagalys in the next article. Interested, Sign-up for your free trial now. 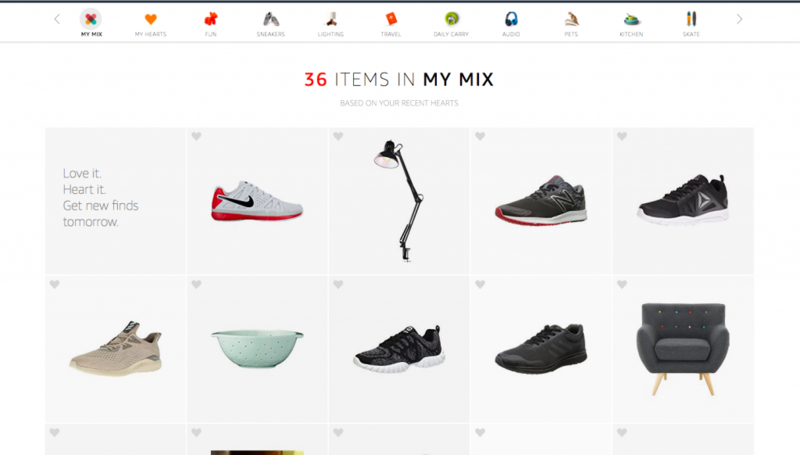 In June 2017, Amazon.com made a quite launch of “My Mix”, a personalized shopping feed that curates “Interesting” products based on visitor interest. Here is a company, that rules the market, commands your attention, for all purposes knows you will come back to Amazon tomorrow to check on on your next purchase. So why a personalized shopping feed? Amazon, knows that tomorrow it will be fighting for visitor attention. Attention, not just from Walmart, Target, Alibaba etc., but from the millions of mobile applications that distract you in your shopping experience. Amazon, is fighting to keep you engaged at Amazon. Only then can the billions of dollars invested in R&D, supply chain, etc have any likelihood of influencing your purchasing decision. What will start as a curation of “interesting products”, will tomorrow most likely be a curation of the entire store, to be delivered as a feed to you. Amazon understands, you the visitor are a busy person, engaging with the store usually on a mobile device. The retailer knows what you want today or may want tomorrow. Given the data is available, Amazon is making the whole shopping process personalized. By this we mean, instead of you walking to the aisles or categories to find products, the aisles that are of personal interest, will come to you. All you have to do is walk into the store and the entire store will reorganize itself, to start showing you products of personal interest. This is personalization of e-commerce, where engagement data is used to predict shopper persona of what visitors are most likely going to buy. Real time 1-1 visitor personalization always existed and with the lowered costs of computing power, it will be applied to across the product discovery journey in an e-commerce store. In the future, Amazon will ensure each shoppers product discovery channels will be 100% personalized, to ensure they get 100% of that shoppers attention. Lose attention, lose engagement, there will be no sale. Why are we at Tagalys excited about My Mix? You will soon find out in a few more weeks. You can signup for Tagalys and get access to our full suite of product discovery solutions. As we speak to new customers, we often hear questions on how we are different from Klevu Search and why customers should choose Tagalys over Klevu. Klevu provides Search as a service only, whereas Tagalys provides powers Search, Recommendations & Intelligent Product listing pages. 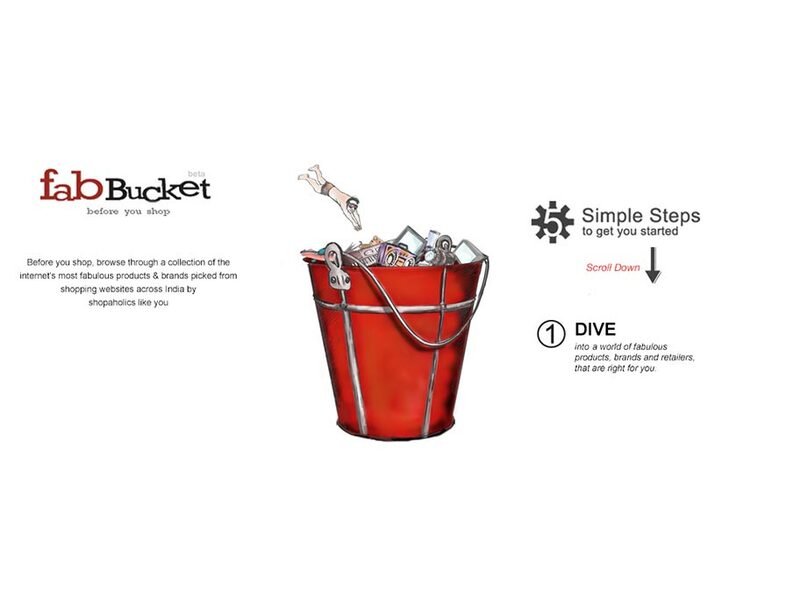 The Site Search funnel is a high value funnel, where Tagalys has recorded conversion rates 3X – 4X higher than other funnels within the same site and between 20%-30% of total revenue. We have been successful with these conversion rates because we collect data from the other funnels, to gather incremental insights thus accelerating conversion rates for customers using Tagalys search. In the world of Tagalys, each funnel has a different intent of shopping and understanding that intent, helps us better understand the customer. Klevu has learning search and Tagalys provides trending/intelligent search, both showcase search results that change over time as we learn form engagement data. Trending search results from Klevu are based on product analytics & Tagalys relies on visitor engagement analytics. It will show the best results across the entire site and will increase conversion. Unless we do a A/B test, it is hard to quantify how much of an improvement in conversion with either solution have over the other. But Tagalys also provides personalized search results, showcasing the best search results, based on each visitors individual shopping persona. This has proven to reduce the time to transact, increase engagement and increase conversions higher than trending results. Personalized search is a must if you have a high mobile traffic with return visitors, to ensure visitors quickly find products when engaging via mobile devices as they are more likely to get distracted and leave your retail site. This gives the ability to retailers to modify the popular searches and showcases other searches, to promote business needs. This gives retailers more control on the search funnel. We do not offer this across all plans, because if done incorrectly it can reduce your conversion rate. While the pricing in each tier is similar across Tagalys & Klevu, Tagalys offers more features in each tier, thereby working towards increasing the conversion of our customers, thus providing higher value to the same price point. This leads to customers getting more value delivered for each pricing tier. Klevu reports are primarily tied to Search as that is the only product offered. Since Tagalys offers multiple product discovery solutions including search, we offer detailer reporting across all funnels that are powered by Tagalys, along with segmented product & attribute reporting. We do not redirect visitors for search queries to any Platform (Magento, Shopify etc.,) powered pages as we are confident the product sorting generated by Tagalys for any listing page, including search is far more likely to convert that the sort order on the platform listing pages. Typical sort orders in a platform like Magento is a manually updated and relies on the retailer to decide the product positions. This is also static, which relies on the retailer to update these sort order. But since our integration, has the data of products across every category or promotion page, we show the products from the same page, but dynamically sorted by Tagalys. Thus if you search fro “Holiday” and there is a promotion for a “Holiday” page, that page will show in search suggestions and the search results will include only products from that page, sorted by what Tagalys does best, increase probability of conversion. Not available at Tagalys. Our core competency is engagement analytics to drive personalized or trending results across search, listing pages & recommendations to drive conversion. Tagalys along with other product discovery channels, gives retailers complete control of managing visitor engagement & revenues across multiple product discovery channels to increase engagement. Tagalys also offers personalization of product discovery that is critical in todays world on mobile first engagement. While Tagalys search by itself can guarantee a 30%-100% minimum increase in search conversion, we do better when we utilize engagement data across multiple discovery channels, as each channel serves a different intent of the visitor. Klevu no doubt is a good product, but improving Search by itself is not going to increase your topline manifold as your business expects. If you want to checkout Tagalys, signup for a test account. eCommerce Site Search – Relevant, Trending or Personalized – Whats right for you? This is an entry level search engine, most suitable for retailers with less than 10,000 monthly visits. Tagalys also offers a free plan for this engine. This version of the engine will still show you accurate search results for any simple or complex search query, but it does not have the ability to personalize results (visitor analytics) or sort results by what is trending (site analytics). You might still consider opting for the C class or S class models, but based on our data analysis across existing clientele we have some average user engagement metrics that point out that this engine is most likely to give you better ROI that the other two. But if your average cart size ($50) or percentage of visitors who search (5% – 10%) far exceeds industry benchmarks, you might want to consider the other engines. We also acknowledge that if you are smaller business you will be starting out with low mobile traffic, acquiring analytics data and visitors are getting to know more about your online store. This a great starter engine to help you tread the waters of online commerce. This mid-segment engine is ideally suited for retailers above 10,000 visitors a month. Retailers at this size start showing patterns of in data as the volume of data show patterns on what products have the best engagement. With this engine, besides showing accurate search results regardless of search query complexity e.g., dress, maxi dress, Zara maxi dress, Zara cotton maxi dress, Zara cotton floral maxi dress, the engine considers historical engagement analytics across the site to determine the best sort order for search results that increases the probability of conversion. This engine should be used as a bare minimum to sort search results which are most likely to sell based on engagement data from the entire site. These results will appeal to your larger audience but not everyone because individual preferences are not considered in product sorting. Hence while this engine may cost more than the A class, it is more likely to convert more visitors to customers. Hence ROI for this engine starts to make sense when you have high traffic leading to high search volume. The top line of our engines is ideally suited for retailers who attract over 50% of traffic coming in via mobile devices and where this traffic is mainly composed of return visitors. Why? Return visitors have shown interest in your retail business. 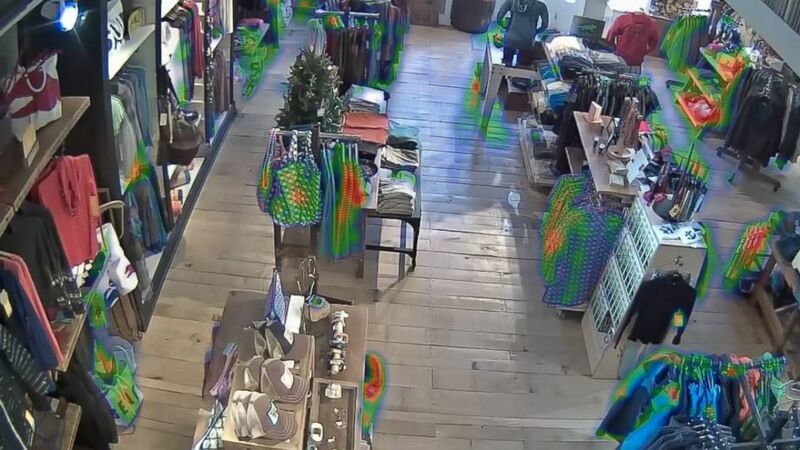 They will share hard and soft data on their intent and as a smart retailer, you can make sense of this data. If your return visitors are primarily engaging with your commerce store via a mobile device, there is a good chance almost 55% may bounce after the first 30 seconds (Refer Hubspot). These visitors get to engage with 2 to 4 products per page screen in a mobile device and in order to find products that are personally relevant to them, they are then expected to filter, sort, scroll and invest their time in product discovery, when you already know what their intent is. How do you keep them engaged in the first 30 seconds? Return mobile visitors is the key driver for search personalization, cause menus, filters and sort options are typically hidden from the mobile interface to reduce clutter. This user interface leads most visitors to scroll through the results and prefer frictionless experiences. And the longer a visitor scrolls to find a product of interest, increase the probability of bounce. So to keep these visitors engaged, the personalized search results from Tagalys, considers visitor specific engagement data to showcase results that are personally relevant to each shoppers persona. Objective is to generate visitor interest to click on a product, to engage. Please note that there is a direct correlation to product views and customer conversion rate. Our analysis with personalized search shows almost 68% of the clicks to a product page happen within the first 4 pages of search results. Hence showing the most relevant personally products, on top per unique visitor increases engagement. Increased product engagement from search results leads to higher search revenue. There are many more fine details that differentiate the workings of each engine and there are a few cases not outlined here, where a mid sized retailer might still want to use a personalized search engine. Interested already – SIGNUP NOW and see your visitor engagement improve. Ok. 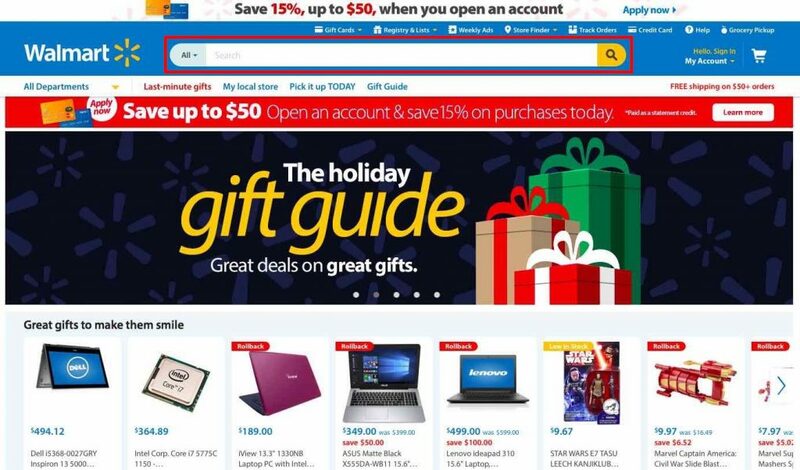 The title was a geared to help in SEO, but the points in this article are applicable to any Make vs. Buy decision when it comes to online retailers and buying technology. As on online retailer, your goal is to try and ensure customers have great shopping experience. Some of the biggest challenges in retail is figuring out what to have in stock, inventory, pricing, supply chain, marketing and branding. That is the retail component. The online in retail is a channel and technology enables you to deliver a similar shopping experience in that channel. So should you build the online component or buy to enable shopping for customers who choose your digital channel? While there are many parts of the online channel like the platform, pricing tools, payment gateways, recommendations, site performance, Personalization etc., Lets go over some areas that will help you decide this make vs. buy decision. What is you core competency? The best way we have figured our core competency at Tagalys in make vs. buy decision, is asking ourselves if we had to sell out (not that we plan to), will that negotiation be hit if that component in technology was not part our our internal IP. So while the engine is always developed inhouse, we sometimes outsource aspects like the UI for our dashboard, charting, connectors etc., that we considered fairly commoditized So, as a retailer and you had to an offer to sell your company, how much will your offer reduce if you did not build the Personalization engine? Do you have a different expectation for Personalization? Personalization engines from Certona, Celebros, Tagalys etc., all run on different algorithms. Some tuned for speed, some tuned for increased personal relevance, some for both etc., If you were to build the same inhouse, are you trying to solve a different problem that cannot be already solved by existing players. What is the 5 year return on investment? How long (pERIOD x) will it take to build a world class personalization engine? When we define time to build, we are talking about the time from Day 0 when this engine can generate the same conversion rate of product views to impressions. That is how you measure if your engine is working at scale, by looking at this metric and not purely on the customer conversion rate. While we were liberal to assume it can be built in a month, truth is it absolutely cannot. With more resources time can reduce, but you need to also consider a learning curve and churn. What is the opportunity cost of making inhouse? This is the biggest variable that is not considered by retailers who choose to build inhouse. While cost is easy to assume assuming no churn and soft costs, it is almost impossible to quantify the revenue lost or left on the table during the period X when a retailer is building this product inhouse. And this lost revenue should also be multiplied by the internal rate of return (IRR) that is relevant to this company. I have been fortunate to sit on the other side (Buyer) of the table in my previous avatar at Deloitte and my previous company, where I always negotiated to get the best value for my client and business. Hence it is important, to look at value through a Total Cost of Ownership lens vs. short term Cost/Price lens. 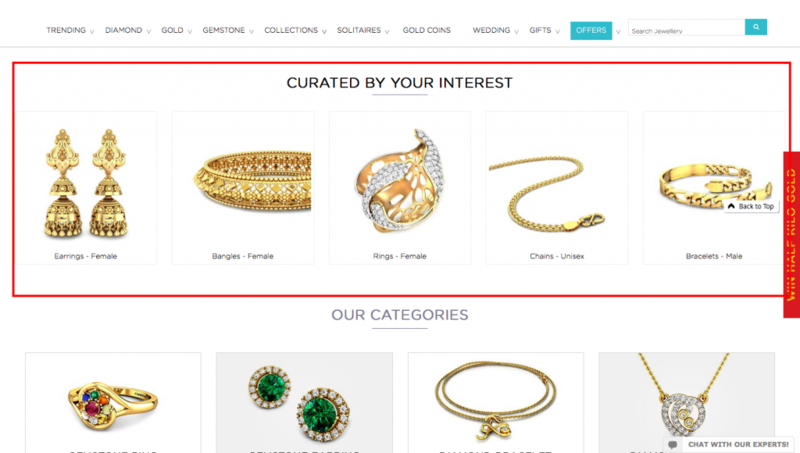 Personalization for ecommerce – How did Tagalys start its journey? Tagalys provides personalization of a service for ecommerce and our apis (using plugins) can be applied to personalize product discovery across channels like site search, recommendations and listing pages. Our founders did not wake up one morning and decide to build personalization as a service, it was built by accident. In their previous avatar, Antony and Palani had conceptualized and built a social commerce platform as they saw a growing consumer need driven by the growth of eCommerce. The supply side of the platform consisted of a complex web of spiders crawling ecommerce sites for products and all public information about them. At its peak the platform covered over 3000 unique brands and over 8 million unique sku’s. The demand side consisted of consumers who were interested in online fashion and home décor shopping. Like most platforms, Monthly active users (MAU) was the primary metric of focus as that tied directly to their current and future revenue model. But how do you keep consumers engaged to ensure churn is minimal? How do you build an engaged community that will refer others to this platform? Early metrics showed users spent over 9 minutes/session and the team was elated, but we also noticed the percentage of return visitors was not as expected. Post feedback with many users, we realized high session time is also an indicator that users being unable to find what they seek. Solving this problem was the advent of Tagalys. The founders first started by building their own analytics engine that collected visitor engagement data and also extracted meta data from products to start extracting insights on why visitors might engage with certain products. The meta data also allowed to create data model or trend analysis to better understand the shopping persona of users. The first step was to start making sense of the data and apply the insights across search and listing pages, so products were sorted by what was most engaging site wide and not simply sorted by new arrivals etc., This logic helped increase engagement but still did not appeal to all users, as what maybe most engaging for user X might have no relation to user Y. The team then went onto analyze data at a user level and found out the high variances users have in preferences for the same category or subcategory of products. Thus the next steps was to build a personalized view for each user for any page they engaged – Search results, Category pages, Recommendations. 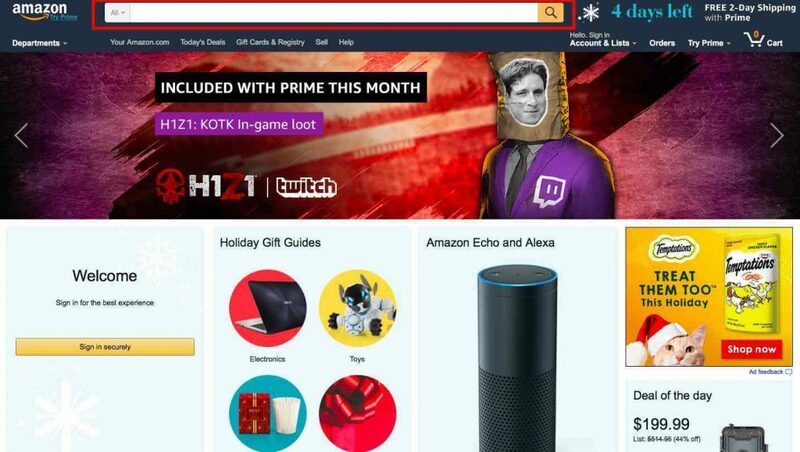 The end result was to showcase a unique set of products that match a user’s shopping persona and based on interaction with the assumed persona, to learn and continue improving the shopping persona to improve engagement. While founders were successful in delivery personalization at scale, as a business it failed. Failed due to unavailability of funds or maybe they were too early, but the learnings of this journey helped build the foundation of Personalization as a Service for eCommerce. When many of the users shared feedback on how such an experience was unavailable at regular eCommerce store, it got them thinking and made them pivot as they recognized the same need for eCommerce to help increase engagement, reduce their CAC and improve revenues. Personalization – Making your eCommerce store visitors feel LOVED has never been easier! Signup now to improve your visitor engagement and save time reading the article. Or read and signup at the end. The journeys that we find most memorable and wonderful are often the ones we take with people who make us feel truly special. Winning your visitor’s heart on their journey to your e-commerce store is in fact not very different at all, when you make their journey a personal one that is close to their heart. Right from the time they enter to the time they register, to the golden moment they make a purchase, and even the stressful times when they abandon their cart or haven’t been in touch for a while. In this article, we cover how your e-commerce visitors can enjoy a journey of a lifetime on your store when you personalize every aspect of it- one they remember for days, in fact even share with their friends and recommend to folks they care about. But first, exactly what do we mean by personalization here? Is it simply just greeting folks by their name? Or showing them products that other people viewed after viewing a particular product. Luckily for e-commerce storeowners and customers, personalization has evolved into something way more powerful, predictive and well, personal than these techniques. 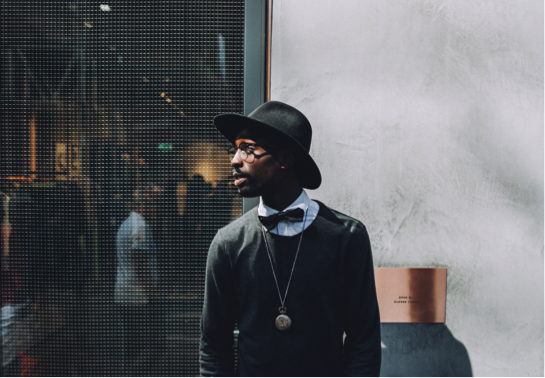 Much like your favorite in-store sales personnel in the world, Jamal, today’s personalization tool is highly iterative, contextual, and real time. The engine is based on artificial intelligence, and thus, constantly learns and updates itself on each visitor based on their interactions as well as those of their counterparts, thus making each interaction more personal, more special, and more intimate than the last one. All this with no scope for human errors and that much more perfection and precision. So, what are just some of the highly essential and relevant variables that are taken into account whilst personalizing a visitor’s journey? Much like Jamal, who would notice your ensemble the minute you walk into the store to decide what kind of products to recommend to you, a robust engine tracks the journey of a visitor and extracts insights about their visitor based on how they interact with your store. Further diving into this concept, if a new visitor from Manhattan entered an e-commerce shoe store during peak winter she’d get very different results from a similar visitor from San Diego. To understand the persona of your visitor, one way to get started is by incentivizing them to fill out out a survey before they start shopping. 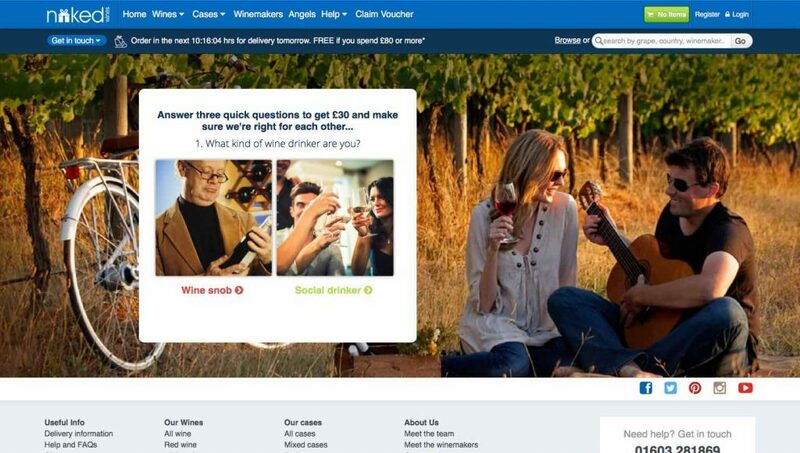 A great example of this is the beautiful wine site, Naked Wine, which woos its visitors to perfection by offering them 30 dollars to take a quick survey so they can create the perfect drinking persona! Incase of a site that focuses on one particular category such as a smartphone which has a wide range in terms of pricing, a good idea could be to quickly ask for a budget range and then create a selection accordingly. Similarly, according to the category of the e-commerce site, similar variants can be made in terms of size, gender, and more. And while the engine tries to understand your shopping interest and persona, it is also making a note of other people who might be similar to you in their shopping persona to start predicting what products that might interest you but are yet to be discovered by you. The objective of creating shopping personas is to ensure personal relevance in any interaction between your visitors and store. Improving personal relevance increases the conversion rate from a listing page (impressions) to a product page. More product views per visitor, increases the probability of sale conversion. 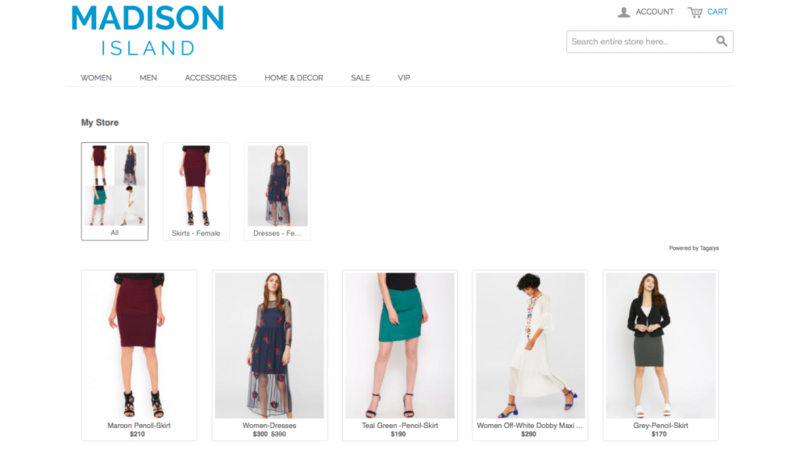 Where can the actionable insights from a personalization engine be applied for an eCommerce store? Over 90% of the interactions that lead your visitors to view products will happen across these channels. By extracting actionable insights from a personalization engine and applying it to these channels, each visitor will be catered a unique shopping experience engaging with products that are personally relevant to them or someone similar to them. We had discussed earlier about how the mobile first interaction by visitors has led to the attention economy. When visitor interaction with products in these channels becomes personally relevant, you keep your visitor engaged, allowing them to patiently discover products that appeal to them and finally convert to customers. Channels like mobile notifications and email. are the lowest cost to build re-enagement. Today, most online retailers send out mass notifications and email that reach every user in the store and may or may not be relevant to them. This spam like behavior has led to emails being confined to a separate tab in your inbox or users turning off notifications in mobile phones. This leads to low click through rates (CTR), reducing the visits generated back to the online store from these channels. By considering the shopping personas generated by a personalization engine, retailers can not only save cost by sending notifications/email to the relevant users, but also increase CTR that leads to improved conversion rates & revenues. eCommerce Search, Site Search or Product Search are a few of the terms customers refer to the experience of allowing a visitor quickly find a set of products that match a search query entered in the search bar within an eCommerce store. Search is key revenue driver at the lowest operational cost for leading retailers across the world. Data recorded by Tagalys across clients shows that although less than 10% of visitors search, they drive anywhere between 30% to 40% of the stores revenue. This is evident as leading global retailers display a prominent search bar with a clear call to action, that drives visitors to search for products. Interested – Sign up now. Site Search is a product discovery channel that can deliver conversion rates almost 2X higher than regular listing pages. These numbers hold water only if you have the right engine and not based purely only on keyword relevance (Search 1.0). Some of the other benefits of Site Search are reduced time to checkout, higher product views per visit and increased order value per customer. But there are many instances of online retailers giving little or no importance to the Search experience within their store. If you already know this, Sign up now and improve your visitor engagement. Lets take a step back and consider offline retail, cause online commerce is only an extension of offline retail. Hypothetically, you own this fabulous brand and open two stores in the same city. They have the same inventory (Product catalog), physical store format (UI) and display Merchandising (UX). But one has a shopping assistant and the other does not. 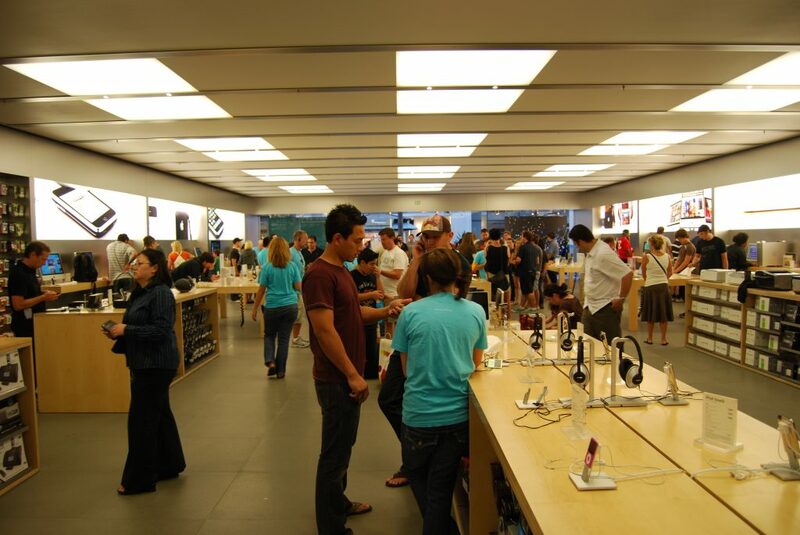 The store with an assistant will deliver more sales and the amount by which the sales will improve will depend on the aptitude of the shopping assistant. Most visitors with an intent of purchase will interact with the sales person – “Do you have shoes?”, that leads to relevant questions “What brand, size, color?”, resulting in products that best suit the query. This is what Search 1.0 for eCommerce is expected to do. Understand what your visitors seek (Search query), ask relevant questions about that query (Filters) and show products (Search results) that match the query (No usage of data analytics). Then came along a smarter shopping assistant (Search 2.0) who started to consider what was sold, what products were viewed and visited the dressing room. With this intelligence, products shown not only match the query but also consider store analytics to support the increase in sale probability. But today, a sales person remembers you, knows what you like or what someone with your shopping persona may like, will show you products for the same query based on individual persona data. Ensuring products shown are not pushed based on store data, but personally relevant to you as it is based in individual shopping persona data. This is Search 3.0. Interested – Sign up now. The rise of Search 3.0 or personalized search is driven by the “Attention Economy” and the rise in mobile first discovery. Almost 60% of visitors engage with an eCommerce store via a mobile device, they are on the move, pressed to time and prone to distractions. Personalization of Search improves visitor engagement as it makes Search a personally relevant experience. What will be increase in operating cost when internal resources are deployed to build the same inhouse? What will be monthly recurring cost (hardware, software and human resources) to build, maintain and continue keeping abreast of the best in technology? What should I budget every month to gain access to reliable intelligent or personalized search almost instantly? What will be increase in visitors who search, if I make the search bar more prominent with a clear call to action and resulting increase in revenue if my search conversion were to improve by a minimum of 50%? What will be the increase in cash flow if visitors become customers faster?